The League of Extraordinary Writers: Reminder: AMONG THE HIDDEN is July's Book of the Month! 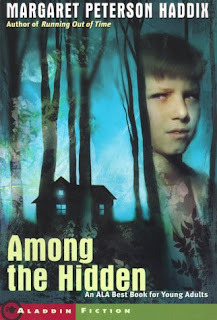 Reminder: AMONG THE HIDDEN is July's Book of the Month! Don't forget that AMONG THE HIDDEN is the Book of the Month for July! Have you been reading along with us? We're going to be holding a week-long discussion of the novel the week of July 26th. Be sure to join us in talking about what makes the book work, how the dystopian genre is represented by it, and more! Who Would You Be if You Were Hidden? Is horror under the speculative umbrella? Why Is Film More Popular?